In the era of uniportal thoracoscopic surgery, deep pulmonary nodules can be hard to visualize or palpate, creating an increasing demand for adjuvant modalities to localize the lesion preoperatively. 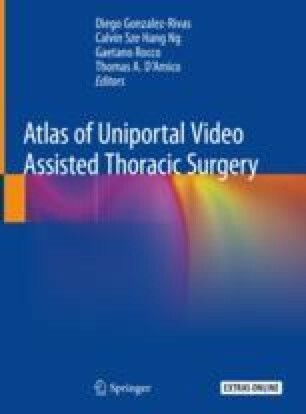 Computed tomography-guided hookwire implantation has been widely adopted by thoracic surgeons due to its feasibility and high success rate. However, procedure-associated complications such as pneumothorax and wire dislodgement can cause patient discomfort or even localization failure, occasionally rendering a thoracotomy inevitable. Several measures have been proposed for optimizing the hookwire technique, including replacing the tip of the hook with a spiral helix, using a soft filament suture as a substitute for the rigid metallic tail of the wire, and use of a hookwire in combination with other localization methods such as the injection of a radionuclide marker. Centralization of the hookwire placement and simultaneous resection performed inside the hybrid theater may resolve the wire-associated complications and provide a promising, cost-effective solution in the future. The online version of this chapter ( https://doi.org/10.1007/978-981-13-2604-2_14) contains supplementary material, which is available to authorized users.